As a parent, one of my worst fears is getting a call that something has happened to one of my kids. 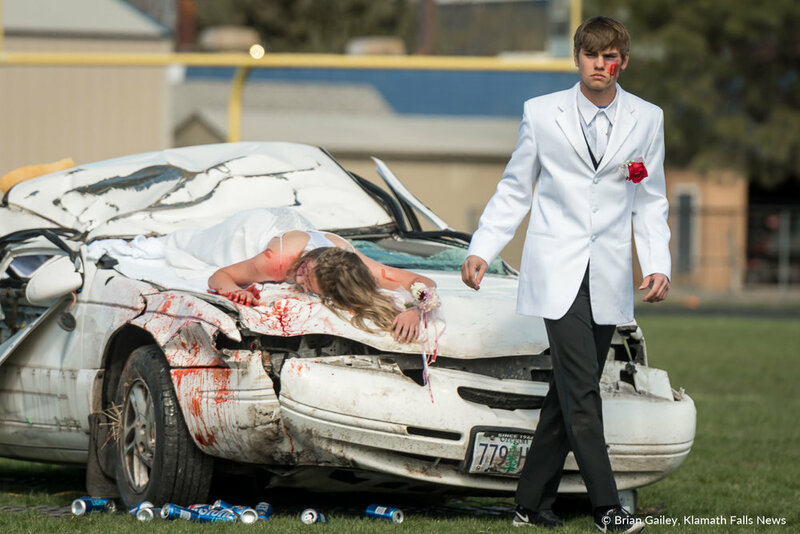 All too often, teens are thrust into making adult decisions such as drinking & driving or even texting & driving. 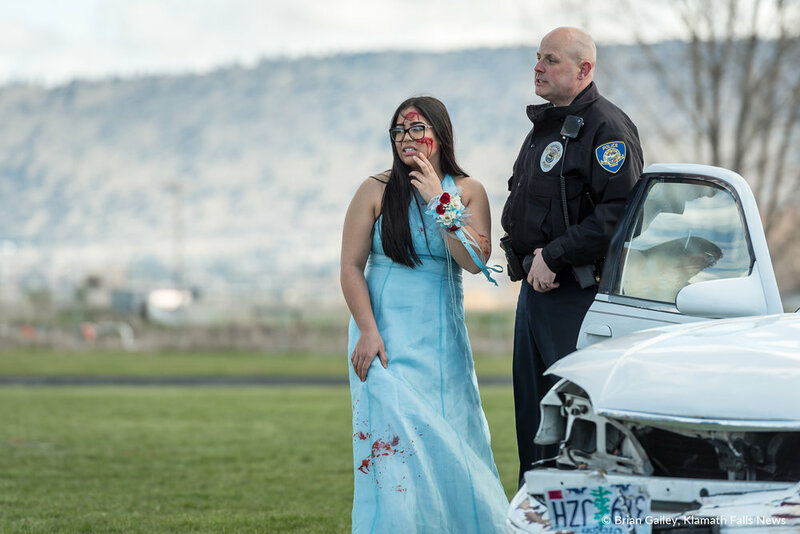 Operation Prom Night is an attempt to educate today's teens about the real dangers of driving impaired and distracted. 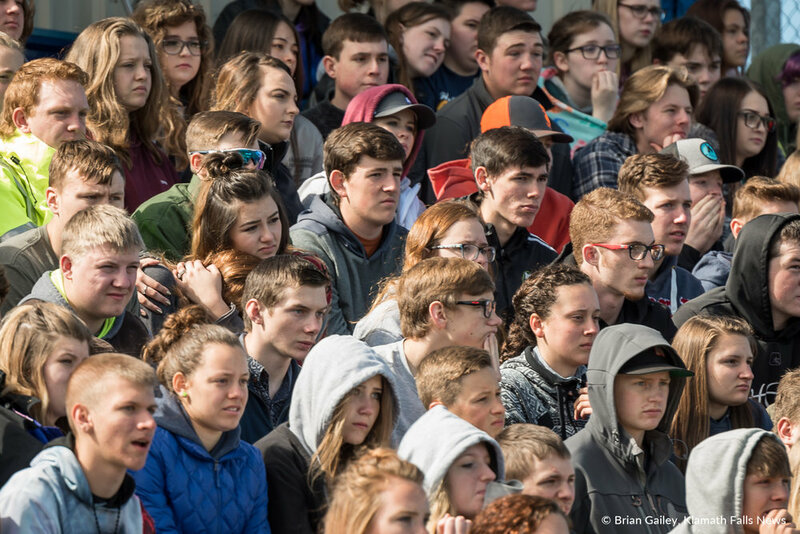 Over 800 students from Henley and Bonanza High Schools watched as the event unfolded right in front of them on the Henley football field. The story began innocent enough, with a group of friends having a great time at prom. 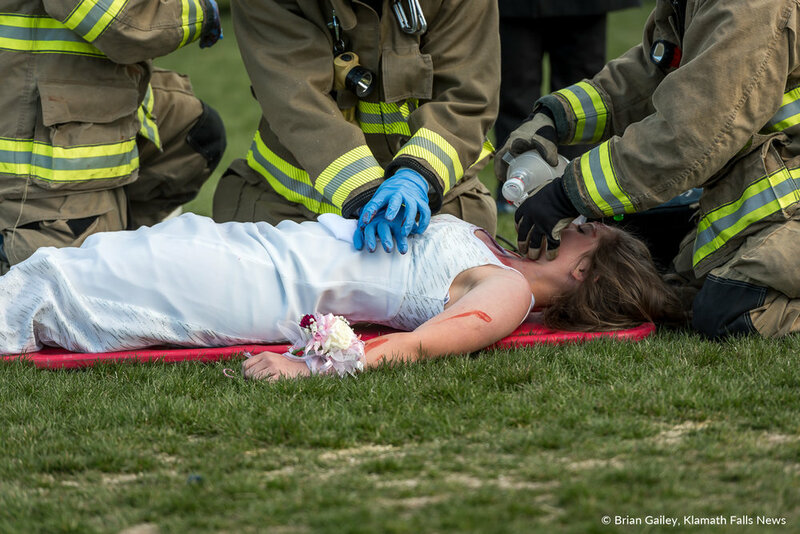 Seven student actors, and dozens of responders from 20 organizations participated in the event. A small group of friends lead by Kyle Hadwick, leave prom early to have a party of their own away from town. At the party, a few friends begin to drink beer that Hadwick stashed in the trunk. Hadwick’s girlfriend, Kaila Mick, chooses not to drink and nominates herself to be the designated driver. Hadwick, along with friends Rodrigo Madera and Paige Peterson, down a few beers each. 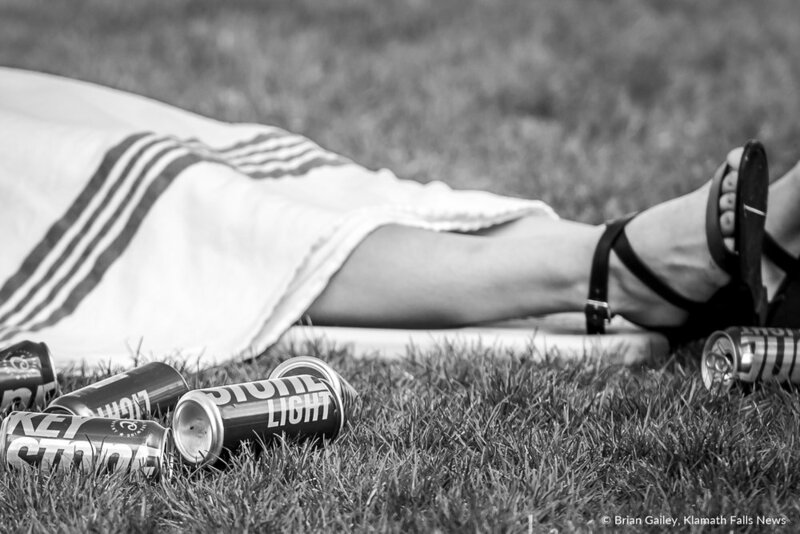 When the beer was gone, they planned to go home. Mick attempted to drive but Hadwick, while buzzed, insisted that he was ok and got behind the wheel instead. 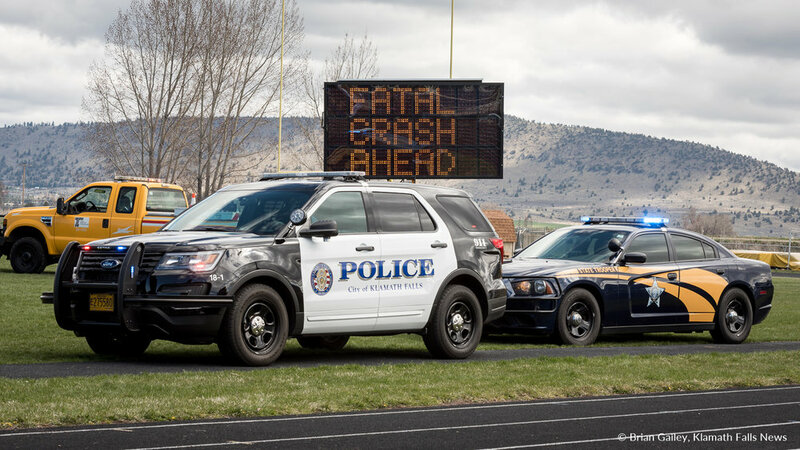 Driving in the opposite direction in Poe Valley was Bonanza High School teacher Marja Hill. In Hills car was her niece, Payton McConnaughy and friend Jessica Northcutt. Hill dropped her phone while texting, and then reached down to grab it. Hill looked up and sees Hadwick coming straight for her; neither have time to react. The crash was violent with both vehicles rolling several times before coming to a stop. Mick was thrown through the windshield and suffered significant head trauma and other injuries. Madera and Peterson were severely injured in the back seat. Madera had a broken neck, Peterson had compound fractures of both her legs. They screamed in agony. Hadwick was virtually unharmed and walked about the accident scene aimlessly. In the opposite vehicle, Hill was mashed against her cars dashboard and steering column suffering fatal injuries. Northcutt was ejected from the car and died from impacting the ground. McConnaughy received only minor injuries but lives with the experience of the loss of her Aunt and friend. With the accident happening in a remote part of Klamath County, it took first responders 10-minutes to arrive on scene. While the injured suffered and bled, the dead were motionles. Upon arrival, first responders evaluated the situation classifying the most critical in need of help. They tended the injured and covered the dead. Peterson was transported via an Airlink helicopter and dies in route. Madera was transported via ambulance to the Sky Lakes Medical Center Emergency Room. McConnaughy was treated at the scene. Mick, Northcutt and Hill die at the scene. Hadwick was arrested for DUII and will be charged with manslaughter and assault among other charges. District Attorney Eve Costello states that given the number of victims, and Hadwick’s reckless disregard for safety, her office would seek 47.5 years in prison. Over 20 separate agencies were involved in the simulation. 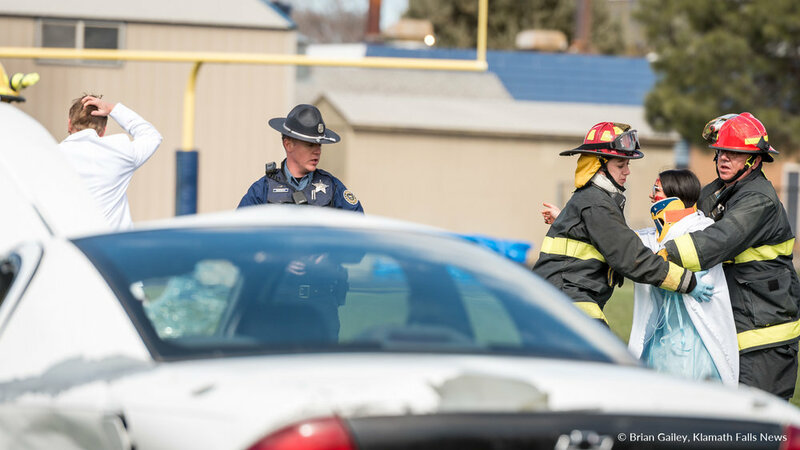 Including; Klamath County Fire District 1, Bonanza Fire, Keno Fire, Oregon State Police, Klamath Falls City Police, Klamath County Sheriff’s Office, Airlink and Oregon Department of Transportation, among others. 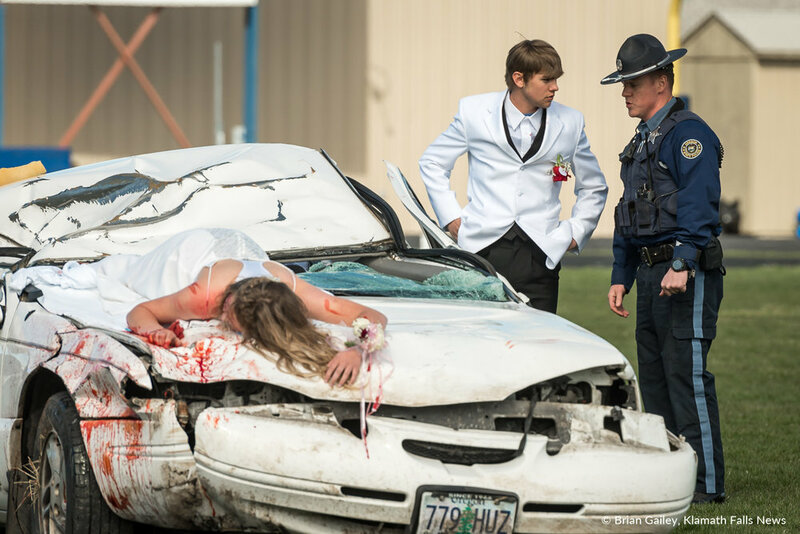 The agencies treated the simulation as if it were a real crash scene. 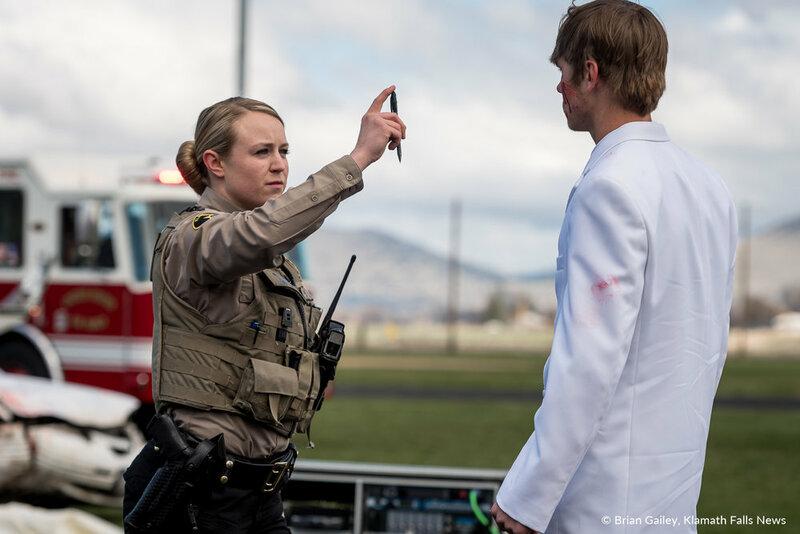 Klamath County Sheriff Deputy Shasta Petersen conducted a field sobriety test on Hadwick. 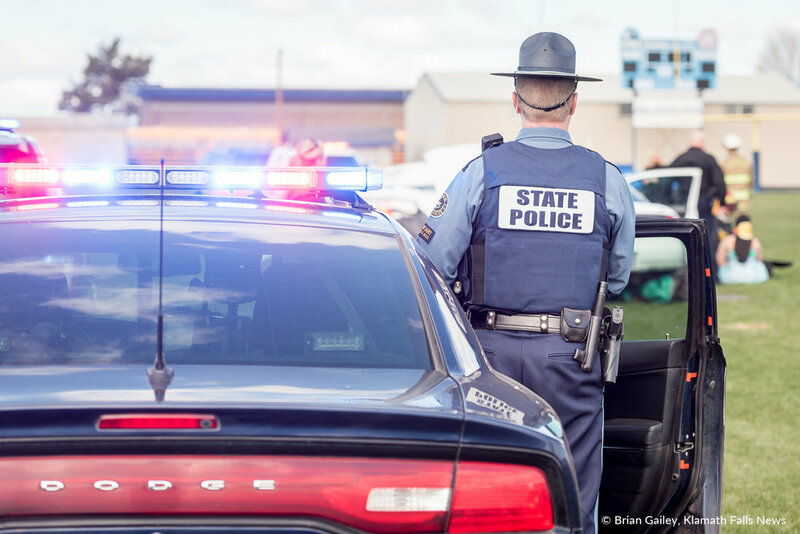 Troopers from the Oregon State Police collected evidence and conducted crash reconstruction. Airlink landed in the field and carried Paige Peterson away. Various fire departments secured injured for transport and prayed over the fallen. 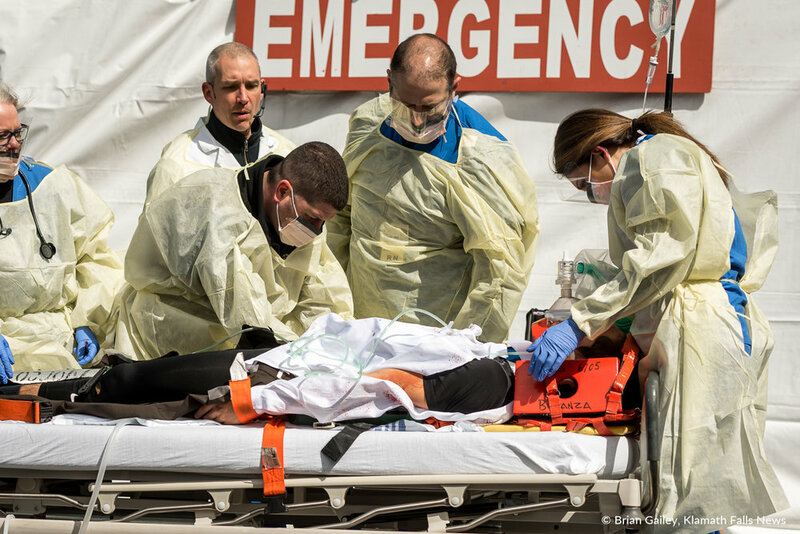 When a crash happens such as the simulated event, many people are affected. 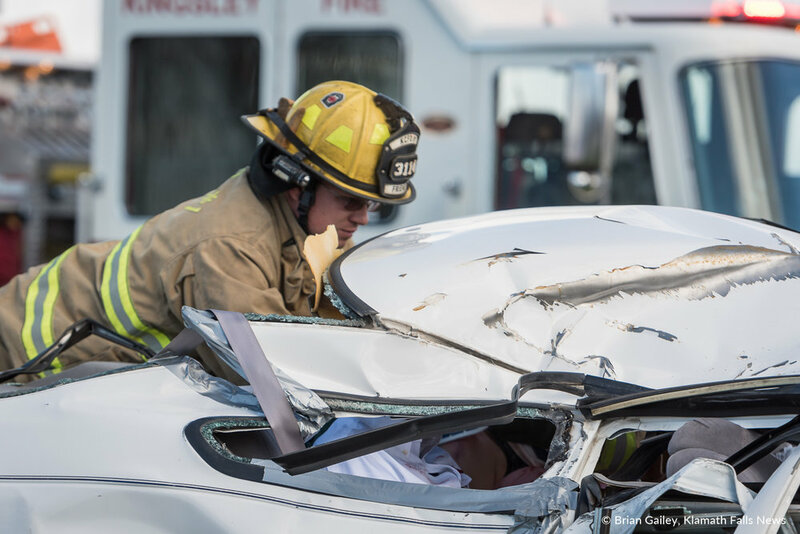 Not just the occupants of the vehicles but also the first responders, paramedics, firefighters, police, hospital doctors, triage staff, family members, parents, and siblings all feel the effects of a poor mistake. Long after the physical pain has stopped, these heroes often carry a major weight on their shoulders with, unmeasurable stress and crippling depression. 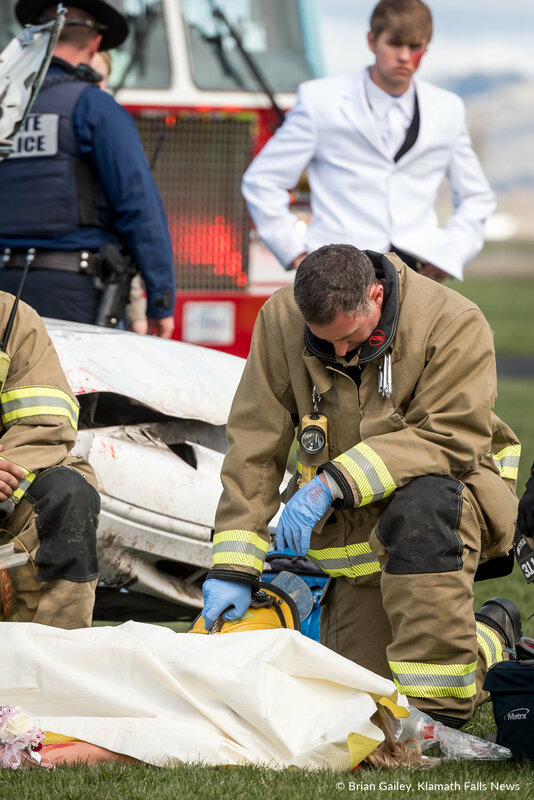 First responders will often participate in a debriefing following the crash to heal the emotional damage. Family members may take years to recover following the loss of a child or sibling. By this time, many of the responders have left the field. Firefighters were tending to Mick’s lifeless body, kneeling over her and saying a prayer. Hadwick watched from the back of a patrol car. Firefighters placed Mick into a body bag and wheeled her on a gurney to be placed inside an awaiting O’Hair’s Funeral Chapel hearse. This was done right in front of the students on the track, for all to see. Many, including yours truly, did not have a dry eye. Large oversized tombstones were erected with the names of the dead from the crash. Family members, walked up to them and laid flowers as the song If I Die Young, by The Band Perry played in the background. An event like this can trigger many questions: What does this all mean? Why do they show this at school? Why should “I” care? Or thoughts of, it will never happen to me. 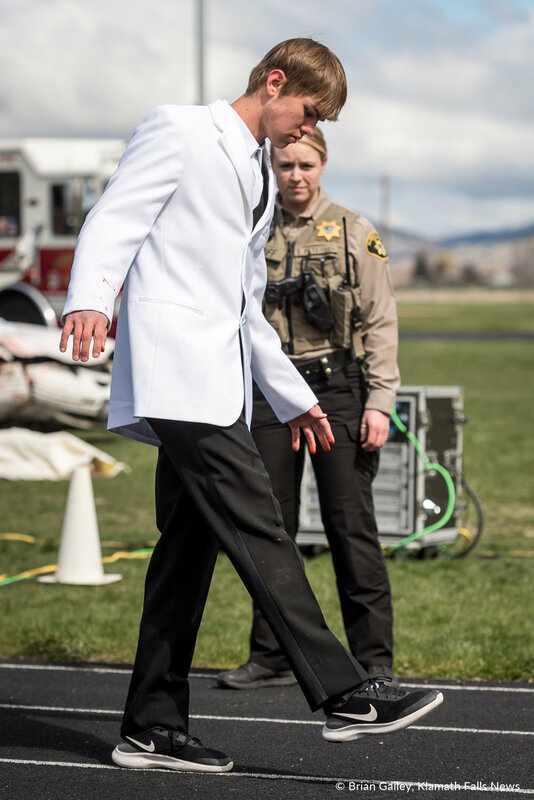 Fellow reporter, Steven Floyd of the Herald and News was also in attendance at the simulated DUII crash. Floyd says it best in the summary of his article, The Human Cost. “… to a reporter who thought he had seen enough to handle the screams. Whatever I imagined taking place in that car pales in comparison to what cops, firefighters, EMTs, paramedics and ER staff have seen too much of. And that’s the answer to the classic question “Why should I care?” A lot of people in that audience, and a lot of people reading this article, will remain unchanged in their view that they are too responsible, or too invulnerable to be impacted by drunk driving. A. The people who have seen real bodies maimed and mangled gave time and effort to relive that experience, so we wouldn’t have to. 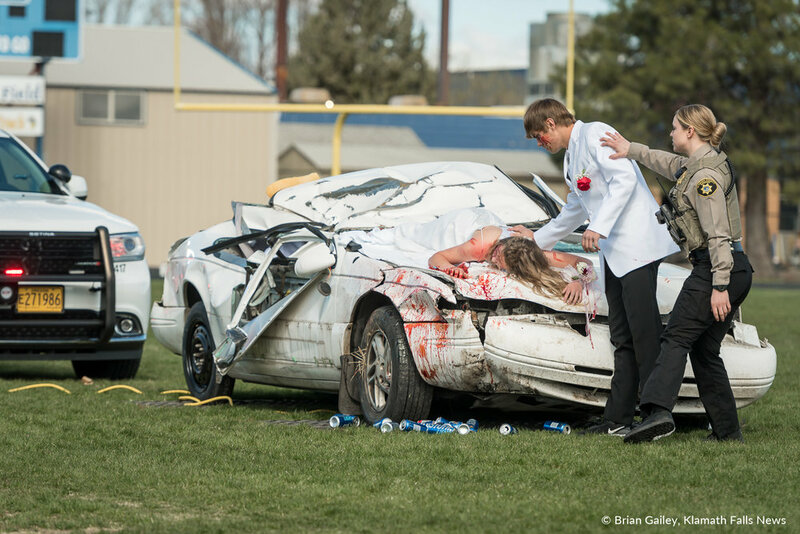 They’ve paid a human cost and paid it again Thursday because students — and everyone — should know the high price of drunk driving. B. Other people typically pay the cost for us. Whether we survive or not, get convicted or not, move on with our lives or not, the people who showed up that day and every day after will pay with their humanity for the decision we made. 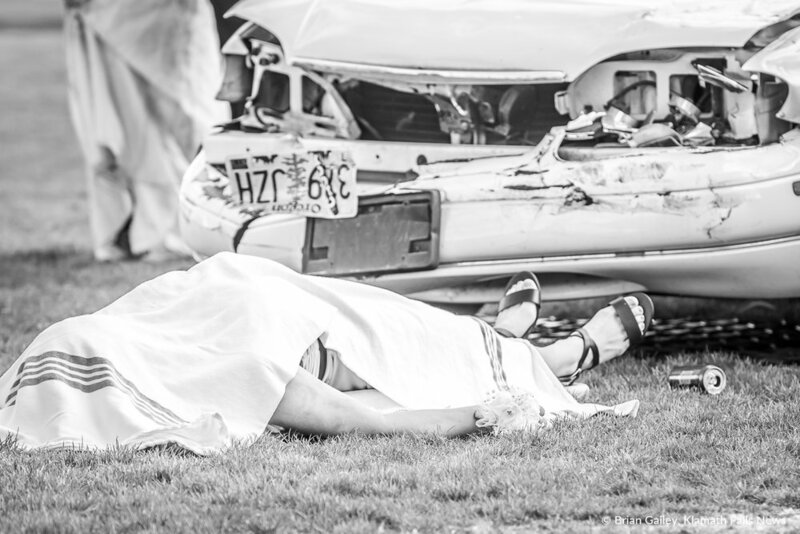 The thought of my child or any child that I personally know, being hurt or killed at the hands of an intoxicated driver scares the hell out of me. However, with that said. I am extremely thankful for our first responders, police, firefighters, EMT’s, ER Doctors & nurses, 911 & dispatch, military and everyone else out there that helps keep us safe, whole and alive. It is because of the sacrifices you make day-in and day-out, that help keep citizens alive after mistakes are made. I have friends in many of the agencies that participated and even more acquaintances within those departments. To each and every one of you, with a tear in my eye, I wholeheartedly THANK YOU all for what you choose to do. To anyone who has a couple drinks and believes you will be fine to drive. PLEASE DON’T. Get a ride, hail a cab, walk, take the bus, do something else. Just don’t drive. To my children, if you or your friends find yourself in a situation that involves drinking, call me. I don’t care what time of the day or night it is. Call me and I will be there. I pledge, that you will not be in trouble, we can deal with those consequences later. At least you and others will be alive, unharmed and safe.